Happily, this Adirondack-real-estate-shilling, skiing blogger is nicely exhausted after two days of long, slow distance cross-country skiing at Mount Van Hoevenberg. The temperatures have moderated from the sub-zero readings of last week, which makes the hours spent on those exquisitely groomed trails even more pleasurable. It was great not packing extra gloves and handwarmers! Whiteface Mountain, our Olympic Mountain that was recently chosen 4th in North America for best places to ski and stay by Conde Nast Traveler readers, is in outstanding shape. Most every trail is open with the best coverage in years. 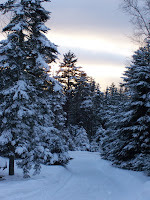 The Adirondack backcountry is in superb condition. I found a great link to Adirondack Interior Conditions, which I hope is helpful to skiers out there who prefer to earn their turns. For the new visitor, this is a blog about the Adirondacks and the wonderful, healthy lifestyle enjoyed by those of us who choose to live and vacation here. There is no doubt, for year-rounders and vacationers alike, the Adirondacks are a reminder how important and nourishing 'nature' is for the human condition. Yes, I sell real estate here, so my waxing poetic about the Adirondacks might seem like a marketing schtick. The reality is I chose to move here twenty years ago after living all over the world. For me, the Adirondacks are a great antidote to the concrete and pavement, crowded malls and highways, video games and shopping, reality-show-nourished America I know exists elsewhere. There is good news for those of you who have found your way to this blog and do not yet own a piece of this Adirondack America. There is still property available at reasonable prices. Let me know if I can help you find your dream spot. Today's photo is a recent view from my dream spot at home.